With the price of some precious metals exceeding $500.00 per ounce, cost-effective recovery of these valuable natural resources is crucial. 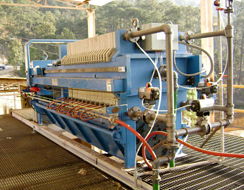 Therefore, equipment such as Precious Metal Recovery Filter Press systems that can achieve the desired goals efficiently and economically quickly justifies capitalization costs. Precious Metal Recovery, Oily Sludge Dewatering, High Grade Mica Processing and Refinery Waste are just some examples of the applications the hard-working EA Series line of Recessed Chamber Filter Presses can tackle. Filter cake volumes from 0.5-300 cubic feet are available, cost-effectively producing high solids filter cake along with an extremely high degree of clarity in the liquid effluent.